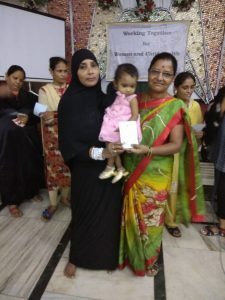 Our SNEHA Centres' programme, currently in its third and last year of implementation in the current phase works on the health and nutrition of women and children, particularly, in the first 1000 days of life (between conception and the child's second birthday). 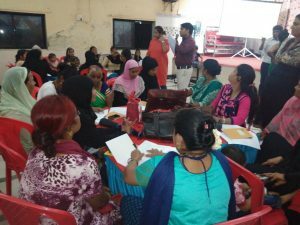 Working in the vulnerable informal urban settlements in Mumbai's M/East ward covering pockets in Govandi and Mankhurd, Mumbai's Eastern Suburbs, the programme employs a bunch of strategies to impact maternal and child health. Among it's key strategies is to create a cadre of community volunteers, known as Community Action Groups (CAG), to mobilise members of community and improve their health seeking behaviour. Our staff regularly work with CAG members and train them in various aspects of maternal and child health. Our volunteers have been an integral part of our programme and key to its success, working regularly to identify cases of pregnant women in the community, refer malnourished children to us or to public health systems, ensure that pregnant women are taking their IFA tablets, referring pregnant women and particularly those with high risk pregnancies for antenatalcare, among undertaking other community development projects such as clean drives. On 22 June, we had a session with some of the CAG members on antenatal care. CAG volunteers discussing aspects of antenatal care. The idea is that each volunteer is allocated about 4-5 pregnant women near her locality. These volunteers visit the women twice a month, armed with a semester-wise checklist. 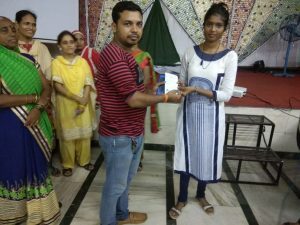 She uses the checklist to check in on the health status of the pregnant woman and reports back to SNEHA's Community Organisers. As CAG volunteers tend to be friends, neighbours and have informal rapport with other community members, it is easy for them to dispense critical health information about pregnancy and newborn care. Many CAG volunteers have worked with us for long terms and we used the meet to appreciate their efforts.